In appearance, Lady Mary has a strong look of her father, the late Duke. She is fair, of middle height, and with frank, pleasant manners which make her popular with everyone. Of her many possessions, the Island of Arran, in the Firth of Clyde, is the most important, and undoubtedly the most picturesque. If, as seems probable, all the building schemes for the development of the island, so long talked of, are carried out, Lady Mary may, in the future, be one of the greatest heiresses in the world. Another of the season’s debutantes is Lady Marjorie Greville, the only daughter of Lord and Lady Warwick. She is a delightful little lady, thoroughly unaffected, with pretty brown eyes and hair, and, without possessing the transcendent beauty of her mother, she is nevertheless very good to look upon. Like Lady Mary Hamilton, Lady Marjorie loves the country and country pursuits; but in spite of her taste for all things rural, she has taken kindly to the various pleasures afforded by London hfe. This year Lady Warwick took Lord Tweedmouth’s large house in Park Lane, which appropriately enough bears the name of Brook House, Brooke being the title borne by Lord Warwick’s eldest son. Here the Wednesday evening dances given by that incomparable hostess were among the pleasantest parties of the season, and everyone remarked how well her young daughter seconded her in entertaining their guests. Lady Marjorie, who is very popular with other girls, speaks several foreign languages with ease and fluency, and finished her education in Paris. Lady Viola Talbot, daughter of the premier Earl, is one of the most admired of the girls going out this season, and has inherited much of the beauty of that well-known personage in Society, her grandmother, Theresa, Lady Shrewsbury, and of her aunt, Lady Londonderry. The latter, who is daughterless, so far as having a daughter to take out is concerned, since the marriage of Lady Helen Stewart to Lord Stavordale, often chaperones her pretty niece, and when she is unable to do so, Lady Shrewsbury undertakes the charge. In addition to her good looks, Lady Viola is very bright and clever, which gifts may also be said to be hereditary, as Lady Londonderry is almost as talented as she is handsome, and Lady Shrewsbury has long been famous for her wonderful taste. Indeed, many people consider her the pioneer of the revolt against the hideous stylo of furniture and house decoration which we still suffered under in the “sixties,” and without being exactly the creator of the “house beautiful,” she may be said to have been among the first to originate the movement to which we owe the regeneration of the interior of our modern dwellings. Lady Guendolen Godolphin-Osborne, who came out this season, is the eldest daughter of the Duchess of Leeds. In appearance she rather resembles her mother, that graceful and charming woman, who, owing to delicate health, has lived more out of England of late years than her many friends could wish. Lady Guendolen has naturally accompanied the Duchess abroad, and is an excellent linguist, speaking French and Italian to perfection. She has three sisters and a very important little brother, Lord Carmarthen, who has only lately made his appearance on the scene. Lady Guendolen spends many months every year at Bordighera, where the Duke of Leeds has built a beautiful villa. A very pretty girl among those who have newly come out is Lady Muriel Gordon-Lennox, the elder daughter of Lord March by his second marriage, and granddaughter of the Duke of Richmond. Lady Muriel is unfortunately motherless, and has made her appearance in Society under the wing of her aunt, Lady Caroline Gordon-Lennox. 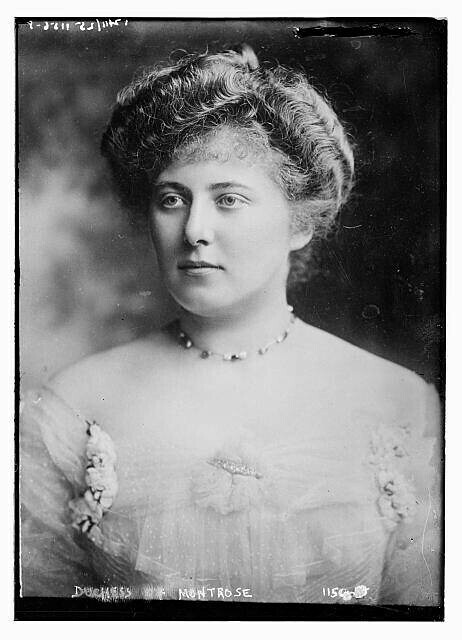 Her half-sisters, Lady Violet Brassey (one of the most successful of London hostesses) and Lady Evelyn Cotterell, have also on occasion taken charge of her. Lady Muriel has a younger sister, Lady Helen Gordon-Lennox, who is just seventeen, and will be one of next year’s debutantes. Miss Diana Sturt, granddaughter of Lord Alington and daughter of Mr. and Lady Feodorowna Sturt, was one of the interesting presentations at the Court this year. As her mother was not going out just then, her aunt, Mrs. Hardinge, was her sponsor on that momentous occasion in a debutante’s career. Miss Sturt much resembles Lady Feodorowna Sturt, with the same dark hair and fine eyes, although she is very much taller than her mother. She is gifted with an exceptionally good voice, and will probably sing charmingly later on. Up to the moment of her appearance on the social scene, she has been deeply engaged with her studies, and has received a somewhat severe education. At Mrs. Adair’s fancy ball earlier m the season, Miss Sturt chose to represent “Diana” in the Olympian quadrille, and her tall and rather stately figure admirably rendered one’s idea of the goddess. Miss Bampfylde, whose father will one day be Lord Poltimore, is a remarkably pretty girl, who inherits the proverbial beauty of the Sheridans through her grandmother, Lady Poltimore. 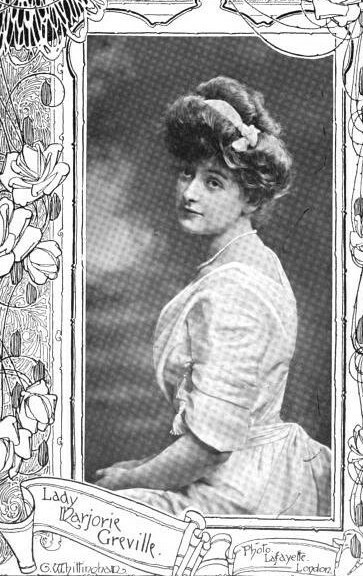 Although this is her first season, she is already one of the most popular girls in London, and her mother, Mrs. Bampfylde, who is an excellent hostess, has given several successful dances for her debutante daughter. Miss Post, whose mother, Lady Barry more, hails from the other side of the Atlantic, is, although strictly speaking an American, practically British, as she has lived most of her life over here. 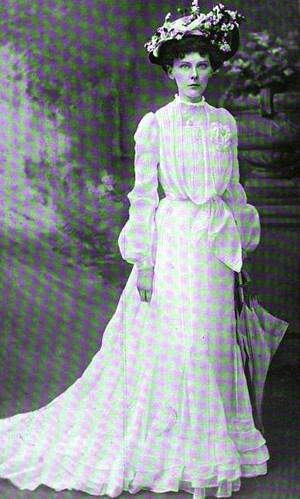 She is a niece of Mrs. Adair, one of London’s best-known hostesses, and at the famous fancy ball was one of those who figured in the “Irish” quadrille. Miss Post is a remarkably graceful dancer, and on the occasion in question looked charming in her quaint green draperies embroidered with shamrock, and with a little Irish harp in her hair. 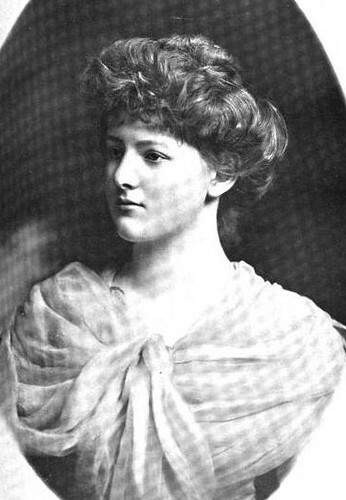 Lady Barrymore, who has lived more in Ireland than in England (her husband, Mr. Smith Barry, now Lord Barrymore, having represented Co. Cork in Parliament for many years), is still very handsome, and as beautiful Miss Lizzie Wadsworth created quite a sensation when she first came to Europe. She has been twice married, her first husband having been an American, Mr. Arthur Post. Miss Colgate, the daughter of Cora, Lady Strafford, who made her first appearance in London this season, although a general favourite, is by no means devoted to Society, and cares very little for going out. She is extremely clever and intellectual, without the least suspicion of the “blue-stocking” about her. Miss Colgate is immensely tall, with a graceful carriage and a charming, thoughtful face. Her mother, who is a very cultured woman—another, by the way, of our “American peeresses”—is a thorough musician and an exceptionally fine performer on the piano. She is the widow of the late Lord Strafford, better remembered as Sir Henry Byng, who was for so many years one of the most trusted members of Queen Victoria’s Household. Miss Algitha Turnor, who is of a more ethereal type of beauty, is the daughter of Mr. and Lady Henrietta Turnor, who took 17 Cadogan Square from the Dowager Lady Manners during the early part of the season, after which they were not in town. Miss Turnor is a very pretty girl, with a rather shy manner, which is extremely attractive, and she possesses that most precious attribute, charm. Another “daughter of the gods, divinely tall,” is Miss Abercromby, whose mother, Lady Baring, married first Sir Robert Abercromby, of Forglen, Aberdeenshire, and secondly Lord Baring, Lord Northbrook’s eldest son. 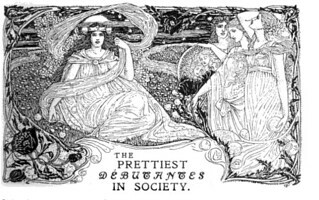 Miss Abercromby was one of the most admired of the debutantes presented at the first Court in May, and her slender figure and fair hair never appeared to greater advantage. Lady Baring gave a ball for her daughter at Lord Northbrook’s beautiful town house, the original date of which had to be altered owing to the illness of Miss Abercromby’s younger sister. A mignonne beauty, of what our neighbours across the Channel call the “keepsake” order, is Miss Dorothy Sinclair, who, as befits a Scottish maiden, made her first curtsey to her Sovereign at that picturesque function, the Drawing-Room held at Holyrood in May. Miss Sinclair has a lovely little face, with wonderful colouring, and is further fortunate in making her entry into the world of London under the aegis of her aunt, Mrs. Owen Williams, who takes her out, as her mother is not fond of Society. Miss Sinclair is the granddaughter of Sir Tollemache Sinclair, the well-known art connoisseur and owner of Thurso Castle in the far North, where the sea beats about the foot of the terrace wall, and the inhabitants, if so minded, can indulge in the “gentle sport” from the drawing room windows. There is quite a little phalanx of charming Irish debutantes, which includes Lady Blanche Conyngham, a sister of the young Lord Conyngham who figured as one of the Royal pages at the Coronation. Lady Blanche, who is small, with delicate features and bright brown hair, is sometimes chaperoned by her grandmother, the Dowager Lady Conyngham, and sometimes by her aunt, who is Lady Blanche, like herself. 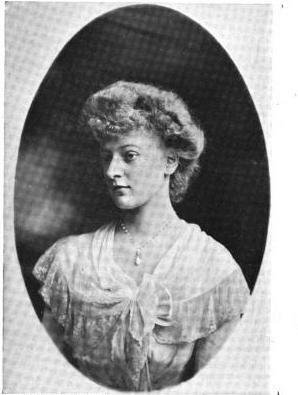 Then there is Lady Aline Dawson-Damer, Lady Portarlington’s daughter, who has a good deal of her mother’s attractiveness; pretty Miss Rose O’Neill, Lord O’Neill’s daughter, who as often as not is chaperoned by her young sister-in-law, who last year was Lady Annabel Crewe-Milnes, and married Lord O’Neill’s eldest son; and Miss Claire [sic] Frewen, who is half American on her mother’s side and a niece of Mrs. George Cornwallis West [Clare was the daughter of Jennie’s eldest sister, Clara]. LOL, they did have a mature look about them, didn’t they? But I guess the whole “you’re an adult once you put your hair up” concept that played a role in how they looked.